Home MoneyMaking Money	What Could You Do if Money was No Object? Have you ever wondered what your life would be like if money was no object? Sometimes, there’s an event or a sudden insight resulting in the realisation that life is short and, it catches us by surprise. Why that ought to be a surprise is beyond me. Just watch the nightly news and you’ll see that life being short shouldn’t come as a surprise to any of us. What’s that got to do with frugal living? Maybe a lot, maybe nothing. It depends on your perspective. Live for now or later? For many of us who diligently live frugally, save our money and do our best to get out of and stay out of debt, the ultimate goal is early retirement – or maybe just a secure retirement. But it seems to me, that’s energy and time focused on the future; sacrificing what you want now so you can enjoy it at some later time. Maybe. Can we live the life we want now and still pay our bills? I’d like to think so. I don’t want to risk there never being a later to enjoy life. I want to enjoy life now! In the snippet below, Alan Watts talks about the questions he asks his students to find out what they want to do with their lives. One of those questions is; How would you really enjoy spending your life? If you take money out of the equation, what would you do with your life? How would you spend your time? These are tough questions to answer because for most of us, we spend all our time focused on the issue of money, not what we’d like to be doing. We have responsibilities. Bills to pay. Food to put on the table. A roof to keep over our heads. Thinking about what we’d like to do generally doesn’t rate highly on the priority list. But it should and it can. Life is too short not to make spending it wisely a priority. How can you change the way you spend your life? Unless you win the lottery, you’ll probably need to start small. Carve out some time every week to do something you love, something that makes you feel whole. It doesn’t have to be a money making venture right from the outset. If you really like what you’re doing you will increase your skill and expertise. Eventually, these could become skills you can share with others for a fee. The more you’ve mastered that skill, the higher the fee you can command. Anything you’re interested in, others are probably interested in, too. There’s always a potential market regardless of your interest’s niche; carpentry, gardening, homesteading skills, food, photography, pet care, fitness. The list is endless. Start working on a plan for making your interest, your livelihood, too. Can you write a blog? Or a book? Can you teach classes or run workshops? Are your handicrafts ready to sell online or at a market? Are you in a position to change careers? Would it be beneficial to gain some qualifications? Do you need to go to university to do that or can you learn the skills some other way? The important thing is to start thinking about what might be possible. How would it feel to spend your days doing what you want rather than what you must? When I first read about bloggers making a full-time living with their blogs, it completely blew my mind. I would never have believed it possible until I started reading their income reports. I started my blog the day I asked myself how would it feel to spend my days writing and running a blog? If your days and weeks and months are an endless cycle of getting up, go to work, get home, go to bed, get up, go to work… Rinse and repeat. Watch the video and take the time to answer the questions Alan poses. It’s time to take control of your life and live it to the fullest. 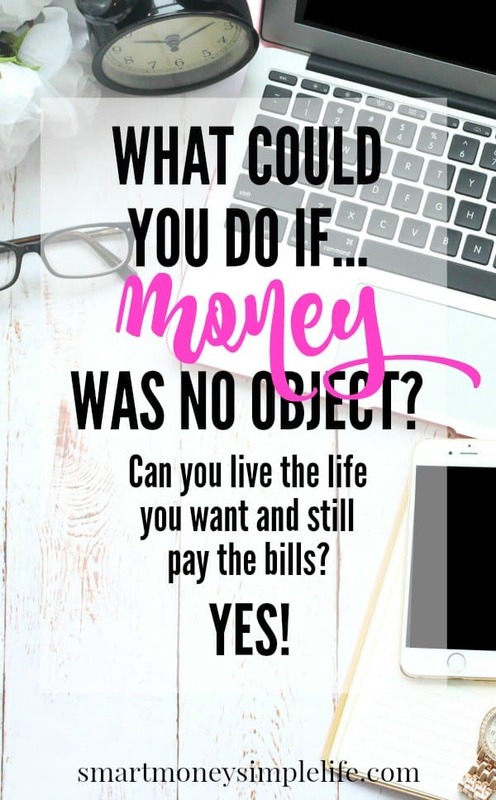 What would you do if money was no object? How would you love to spend your days? Please share your thoughts in the comments. Great post! Yeah this is so true, a lot of people consistently worry about money everyday and no wander they are stressed out. WE need money to live but it shouldn’t rule our lives you know? This was great, it is so important to put money in the right perspective. It should enhance our life, not rule it. I left a very high paying job for a job that resulted in a 75% pay cut. I admit it wasn’t always easy, but I was so much happier and never once went without what we really needed. Wow! That was a huge step to take. It feels like a big risk at the time but sometimes *not* doing it is the bigger risk. It sounds trite but, happiness is priceless. Simple answer? Turn what you love doing into a side hustle and build it from there.